Up until now I’ve worked exclusively with through-hole components. While they’re great for fast prototyping, it’s becoming more difficult to find DIP versions of every part I need, especially for some of the more recently released devices (USB controllers, ARM-based MCUs). You may find a DIP package here and there, but the majority is only available in various surface-mount sizes. The only way for me to keep up is to learn how to solder surface-mount packages. Over the past few months I’ve been gathering all the tools I need to move my soldering techniques to the next level. Last week I received the final parts on my list – a high-quality soldering station, iron tips for soldering surface-mount packages and a head-mounted magnifier. With everything ready for my first surface-mount experience, I grabbed one of my I2C EEPROMs and an adapter board, and gave it a try. This EEPROM comes in an SO-8 package, with 1.27mm (0.05″) lead spacing. That’s half of what I’m used to with a through-hole DIP package. The black plastic body is only 5mm x 4mm. 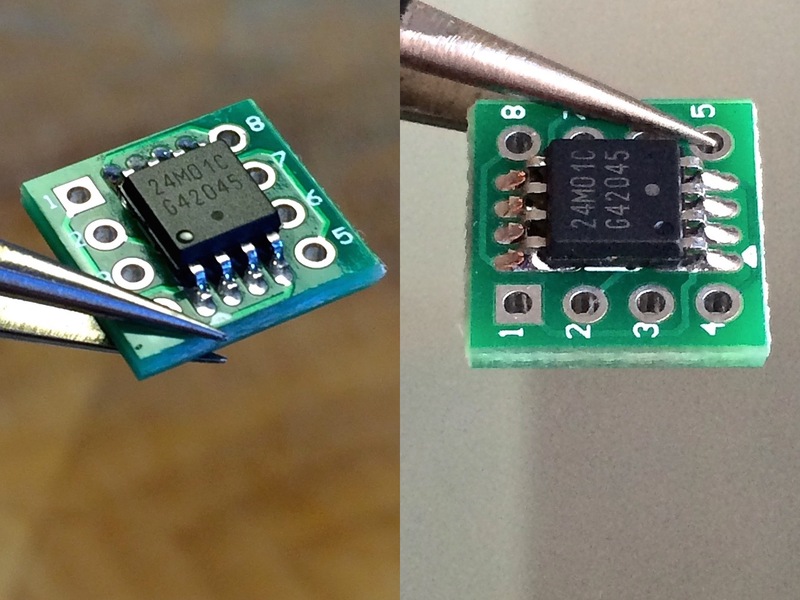 When soldering parts this tiny by hand, it can be difficult to see what you’re doing, especially when you consider the SO surface-mount package is one of the largest sizes available. I had to zoom in all the way on my phone’s camera to take a half decent picture. I may have to invest in a real camera and a macro lens at some point. I soldered the leads with the SMD flow tip I wrote about in a previous post, and used a technique called ‘drag soldering’, where you simply drag the iron across all of the generously fluxed leads and pads on one side of a package, instead of soldering them individually. The difference between drag soldering with an SMD flow tip and a regular chisel/flat screwdriver tip lies in the concave well part of the tip. The small, molten solder reservoir wicks away any stray solder when you drag it across a surface, preventing bridges from forming between leads. As promised, everything worked like magic. The first time I dragged the iron across one of the sides, the results were so perfect I didn’t immediately notice anything had happened. There were no solder bridges at all, and the leads were bonded to the pads on all sides with both a toe and heel fillet. I’m not sure if I used too much solder, or if this is an acceptable amount for a surface-mount package, but that’s something I’ll have to experiment with further. Now that I’ve had my first taste of soldering surface-mount packages I’m ready for more. There are so many new ICs to incorporate in my designs, I’m not sure where to start. I could possibly grab some of the more advanced Atmel microcontrollers, like the ATmega2560 or ATmega32u4, perhaps even some of their ARM-based ones, or play around with a (genuine) FTDI USB controller. 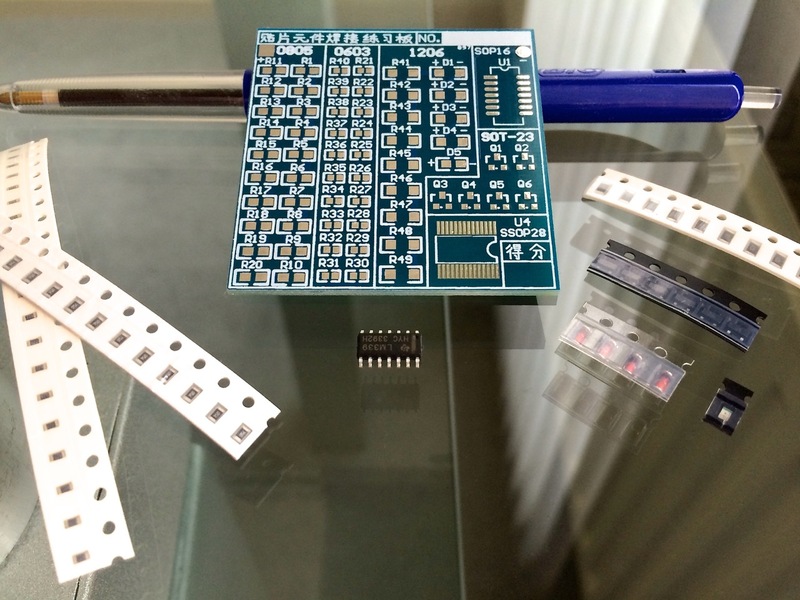 I’ve already ordered several adapter boards for the most common surface-mount package types, so I can still easily try them out without designing an entire custom PCB. In the meantime, I’ll give this Chinese SMD practice kit a try, and see how easy 1206, 0805, 0603 and SOT-23 packages are to solder. BIC ballpoint pen for scale.